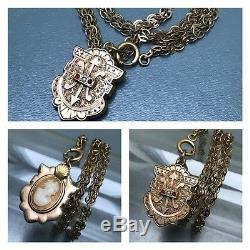 Antique Victorian Rose Gold Fill Carved Cameo TWO WAY Pendant Chain Necklace. Antique Victorian rose Gold filled Charm /fob Chain pendant necklace Pendant has carved camoe on one side and other side has engraved design with paved seed pearl and glass cab in center Necklace ends with circular spring clasp and "O" ring at the end. Charms Dates 1880's 1900's. Tested for GF Measurements: Necklace chain is 15 3/4 inches in length x 1/4 inches wide Pendant adds 1 1/8 inches in total drop length x 7/8 inches max width. Weighs 16 grams on my weighing scale. Condition : Overall good antique condition.. With some metal discoloration /darkening seen No chips or cracks to the cameo.. Some surface wear , comes with age and use Clasp is in good working order. Please also study the photos carefully as its also part of description. I'm no jewelry expert... I try to do a little research before listing the items. And I try to describe to my best. As I work Hard for them. Certain images/photos incorporated into this template are the royalty free property of Karen's Whimsy Public Domain Images. Get Images that Make Supersized Seem Small. Tailor your auctions with Auctiva's. Attention Sellers - Get Templates Image Hosting, Scheduling at Auctiva. The item "Antique Victorian Rose Gold Fill Carved Cameo TWO WAY Pendant Chain Necklace" is in sale since Friday, December 15, 2017. This item is in the category "Jewelry & Watches\Vintage & Antique Jewelry\Costume\Victorian, Edwardian 1837-1910\Necklaces & Pendants".